List of high vitamin D food sources so you know what foods contain vitamin D helping your get the best calcium absorption your body can off easy. Get on top of it with a list of vitamin D rich foods with the highest nutritional value to aid in calcium absorption. Whether you are getting your daily vitamin D in your diet or getting out side and making your body do it for you, you are going to need vitamin D to promote strong bones. Vitamin Rich Foods such as that containing vitamin D said to aid in calcium absorption in your diet essential for building strong bones. Natural Sources like that made by your body or from animals and vegetable sources are where vitamin D can be found. Getting enough vitamin D rich foods in your diet prevents malnutrition and lack of vitamin D. This ensures optimal absorption of calcium by your body. Eating foods with vitamin D help you keep your diet afloat. In this healthy Slism, we present a food list highlight natural sources highest in vitamin D to help restore balance to your diet. Vitamin D plays an important role in bone health and the nutrient absorption of calcium. It supports healthy absorption of calcium by your intestines and helps your get stronger bones. There are 2 types of D vitamins, namely vitamin D2 and vitamin D3 that are collectively referred to as Vitamin D.Each D vitamin can be found from different sources and play a separate role in your body. Here we will introduce the sources and role that each D vitamin plays into your health. Vitamin D2 is produced your body when UV-light hits your skin. 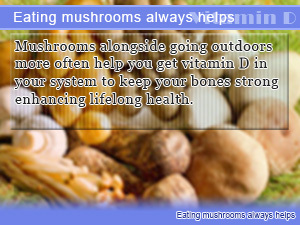 Like vitamin D3 it can also be found in natural food sources such as mushrooms. When exposed to the sun's rays your skin produces pro-vitamin D3 a separate D vitamin to vitamin D2. As a precursor to exposure to the sun, locked away in your skin is something called provitamin D3 which is used in making vitamin D3 identical to that taken from food sources. 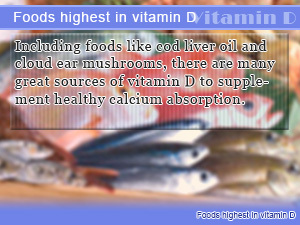 Foods high in vitamin D3 are seafood such as fish and shellfish. After being produced or otherwise absorbed by your body, vitamin D is taken in by your liver and kidneys where it is used as a medium for transporting protein throughout your body as well as an aid in calcium absorption helping you build strong and healthy bones. How Much Vitamin D Should You Be Getting In Your Diet? The recommended daily intake of vitamin D is 5.5μg for men and 5.5μg for women between the age 18 and 29 years old. Whether you are a man or a woman, you be getting over 50μg a day. Getting more than this amount may result in overdose. When you don't get enough vitamin D there runs the risk of your bone health deteriorating as it would lower the calcium absorption in your diet. In other words lack of vitamin D my trigger calcium deficiency affecting your bone health. Continued over time there is a risk of bone deformation or other bone related illnesses to occur. Having too much vitamin D can have an adverse effect on your health including hypercalcemia and kidney damage. Keep in mind that lack of vitamin D is not the only problem trying to stay in bounds of the recommended daily intake of vitamin D.
Here is a list of foods highest in vitamin D including vegetable and animal sources to work into your program for balanced eating. Keep in mind the recommended range of vitamin D consumption when looking over this list as a reference. In general, fish and other seafood are a good source of vitamin D3. 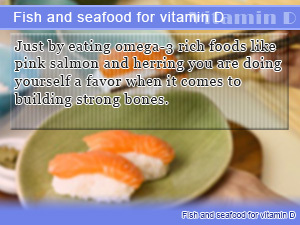 Consuming these foods raw such as in eating Sashimi or grilled is a good way to get vitamin D in your diet. Since vitamin D is a fat soluble vitamin eating vitamin D rich foods accompanied with oil is recommended for enhanced nutrient absorption rates. Mushrooms are considered one of the best natural sources of vitamin D2. When cooking making use of any broth used to boil mushrooms is highly recommended. If you don't get out much and often find yourself spending too much time indoors, getting vitamin D in your diet is a must. Although your body produces vitamin D internally when you get sun from going outside, staying in doesn't help your body make vitamin D you need to absorb calcium in your diet. Get out a take a walk when it's sunny out. Even if you are not much of a walker, do it for the vitamin D so that you can properly absorb calcium. Pick a day out and call it your vitamin D diet day. Use that opportunity to supplement the vitamin D you get in your diet getting outside more often. Including foods like cod liver oil and cloud ear mushrooms, there are many great sources of vitamin D to supplement healthy calcium absorption. Just by eating omega-3 rich foods like pink salmon and herring you are doing yourself a favor when it comes to building strong bones. Mushrooms alongside going outdoors more often help you get vitamin D in your system to keep your bones strong enhancing lifelong health.